Memories of running “back in the day” and of the rag-tag college roommates who brought marathon running to the South…. It is a beautiful spring day here in Georgia. The newness of life is all around as I “piddle” doing some overdue yard work. Several times now during the past hour, some joggers have come shuffling by. I never fail to comment as they make their way up the quarter of a mile hill in front of my house. “Looking good” and “Great form” are samples of the encouraging words all runners like to hear. I smile, and a sea of patched glimpses like bolts of lightning fire through my mind. I smile and remember. I have volumes of montages of nearly 60 years of races, places, faces whom I have met… runs of short distances, long distances, multi-day runs, and endeavors measured by the calendar rather than a stop watch. I am oblivious to all around… It is surreal how this last runner going by has triggered a stream of pleasant memories… or at least they seem to be pleasant now. I would go back in time and do it all over again. There were a few of us, ragtag as we were, who didn’t know a thing about the science, strategies, training methods, physiology … We just ran…and somehow, it worked. We were our own human performance laboratory. Early on in my life, being raised on a farm I discovered running was something I could do… and do well. Sometimes, I missed the school bus and Dad would say, “If you can’t get your work done in time, I reckon you’d better start hoofin’ it on to school.” So off I would go for several miles. I never questioned Dad nor thought it odd. You respected and minded your parents. I had an unusual ability, and my Daddy made sure this skill was put to good use. Farmers would come and ask to borrow me to chase after some mules, horses, or cows which needed to be rounded up and put back in their place. A lot of laughs come from the children when I tell the story about when I was seven and chasing a rabbit for some five hours before catching him. I tried keeping him for a pet. I come from a part of Kentucky which at that time was legendary for the amount of “Moonshiners” we had. The sherriff drove up one day and inquired of my Dad if he would let me be used to chase one of these “Local Businessmen” down until they could get there and make an arrest. I passed on that civic responsibility. All right, now, this is just some “warm up” background which will transition to some really cool experiences, and to introduce two men who played a profound friendship role and influence in my life. It was a time when I was desperately trying to find any road, hog path, anything, as long as running was to be a part. Let me now bring forward Jack Mahurin and John Sears. We were college roommates living in a house off campus. We were so far ahead of the characters depicted in “Dukes of Hazard” and “Duck Dynasty”… We were truly “country” before country was cool! … and running was the common thread we shared. OK, Stan, get to the stories. The longest distance being run in colleges during the early to mid-60’s was two miles. I promise, that was it! …To me, that was a sprint. I knew there was a world far beyond that short distance. In that time, running was considered a “minor sport,” and after college… you put your running shoes in your closet. Running was something you did in school… End of story. The three of us were “mavericks” of that time. We were all in love with the same passion… running. Once you have embraced the joy of knowing you can go any given distance… this becomes a new benchmark in your soul… and your heart and feet long to return time and time again to that space and place. I was able to coax Jack and John to join me on some of my training runs. Many times this would consist of running five miles in one direction… taking a break at someone’s house who said we could get a drink of water from their water hose… then running back. It wasn’t too long after, they were hooked. Our training runs became even longer. What if we put on a Marathon in Kentucky? 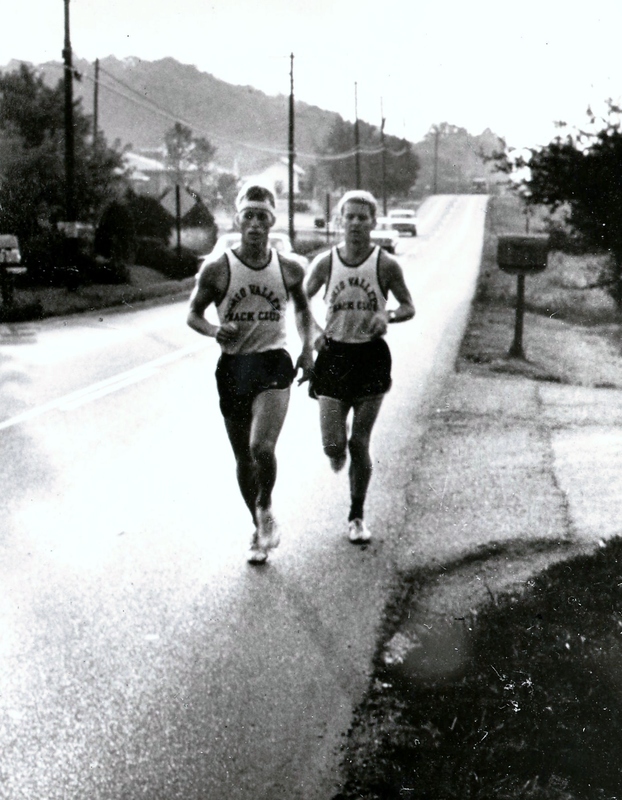 Roommates Stan Cottrell and Jack Mahurin take a rest on distance run – What can we do next? On one particular time of “setting around,” we had a “what if” moment. “Let’s put on our own marathon here in Bowling Green, Kentucky.” So what if there had never been one before in Kentucky, let alone in our neck of woods? We never really thought about this having any earth shattering significance, other than we wouldn’t have to drive hundreds of miles after finding out about a 10 K run or a 10 mile road race. I suppose it would be like several musicians jamming all the time and having a “eureka” moment. Let’s put a show together. We had the idea. We were brash or naïve enough to believe in and act upon this course of action. The dye was cast. We started our mailing program to coaches we had heard of or met along the way. We made a homemade race flyers, and ran the pages off on an ink mimeograph machine. Those were the days when postage was 3 cents. I picked up enough soft drink bottles and cashed them in for 3 cents apiece to pay for the mailing. We had a 25-cent entry fee… Trophies for the first three 3 finishers, and that was it. Our budget was something like 30 dollars, which represented a lot of money. Minimum wage was 60 cents an hour. In those days, the ideas of T-shirts, Certificates of Completion, photographers capturing everyone’s picture for their possible purchase, bibs with digital chips, etc. did not exist. The big race day arrived. We had 10 people show up, representing 4 states: Oscar Moore, an Olympian, runner from University of Illinois, a coach, a long distance champion from the Big Ten, and five others… and there were the three Kentucky boys. 13 runners in all. The marathon course was measured beforehand by driving a route we thought would be “challenging” and interesting. We drove a pickup truck and measured the course by a speedometer. Part of the course included a couple of miles on a dirt portion of the “Big Road” called I-65 being constructed in our area. Reflecting on the actual course, it was really good… even by today’s standards. It was a route winding through the rural Kentucky back-roads of Warren County. There were the rolling hills, shade trees, and fields of hay which had been freshly bailed. As I alluded to earlier, the temperature was in the 90’s. The brutal heat started taking its toll after the ten mile mark. I would look up and see myself getting closer and closer to some of the runners who had gone quickly out of my sight early on. Around the 19 mile mark, I started passing people. To my amazement, I ended up in second place. Even though some of the participants had stopped running… they walked the rest of the distance. No, that did not happen. In fact, there was a code of honor which meant you would crawl before you quit. It was after dark when the last two walked across the finish line. All who started finished the course. Our closing ceremony consisted of having a tub of bottled Cokes, and all of us just laughing and talking about other races we heard of being organized. It was a different time… a different breed. We were a fraternity. We were outside the box. On a hot summer day, outside the city limits of Bowling Green, Kentucky, a group of rag tag characters gathered, answered the “Ready, Set, Go” signal… and forged a new dimension of human endeavor to a geographic region. Marathon Running had come to Kentucky and to the South. We had done something remarkable… We couldn’t process it at the time. Maybe this is why it has now taken me almost 50 years to put these thoughts on paper. Mr. Sevaride… you were so correct about time. We plowed new ground and planted seeds which took root. I smile… sweet memories… how they linger… how they ever flood my soul. Precious sacred scenes unfold. I continue to “Run, Run, and Remember.” What a treasure chest. one, everywhere he runs! Stan Cottrell…is…an Ambassador for the Lord!